Greetings friends and fellow crafters. LeeAnn here with my first project for the Spring/Summer 2018 Coffee Lovers Blog Hop. 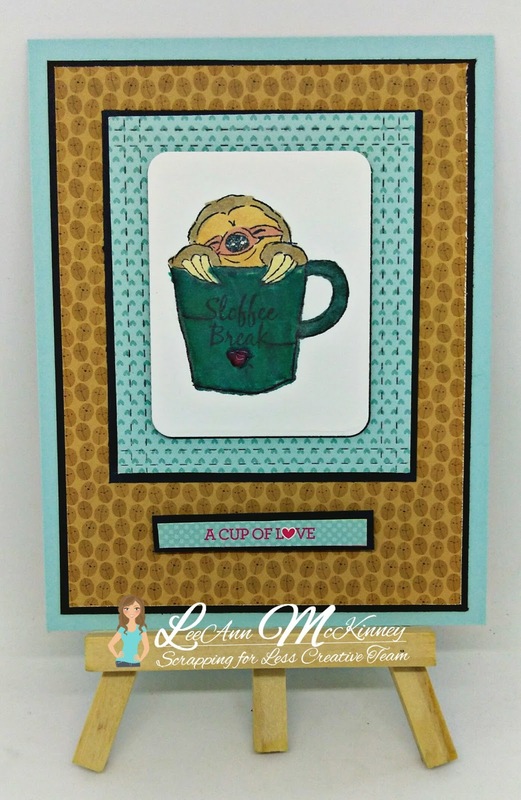 I really look forward to this hop each time and am excited to be representing Scrapping For Less with an Art Impressions Stamp set called "Slothsome" today. This little guy was so fun to work with, and I really do want a sloth of my own. To make this card all Items I used came from past Scrapping For Less Flavor of the Month card kits. In January the theme as Coffee, which included paper from the 6x6 Doodle Bug Designs Cream and Sugar paper pad. From that I used the coffee been background, the teal blue heart background, along with the sentiment strip. I used Sno Cone Blue paper for the card base and Black Licorice for the layers. I stamped the image from the Art Impressions "Slothsome" stamp set using Versafine Onyx Black ink and my Tim Holtz Stamp Platform to stamp out the image. I then used Ranger Clear embossing Powder to heat set it. I used Chameleon alcohol markers to color my image, and Strawberry Coulis Nuvo Jewel Drops to highlight the heart in the Coffee Cup. I will be back tomorrow with another fun coffee project for you. I too like your card very very much with the cute Sloth having a break. LeeAnn this is such a cute card!! I love that sloth in the cup! This is SO cute and I love how that little guy is peeking out! Cute little sloth. Great color choices. Cute image and fun card. So cute, a sloth in a coffee cup! seriously, this is awesome. I love that sloth! Oh my... that sloth is on my wish list... love this! Oh, so cute! Love the way you showcased the focal image too with those layers. He makes me want to crawl into MY mug--he loos so happy-cozy! Adorable card! That sloth is so cute!